Fifty-six-year-old Cajun artist George Rodrigue has been a successful Cajun painter for over 20 years. He created his first Blue Dog in 1984 in a book illustrating Cajun tales. He has now painted over 1,200 Blue Dog paintings, which go for at least $20,000.He painted a light-blue Blue Dog during the CBS News' Early Show and talked about his new book, A Blue Dog Christmas, with CBS News Early Show host Bryant Gumbel. BRYANT GUMBEL: Tell me about the Blue Dog Christmas. What does the dog have to do with Christmas. theme, it would be fun. It took me like four years to do these 22 silk-screen prints. BRYANT GUMBEL: There's 22 prints. There's an ornament in the back. Take a look at the ornament in the back of the book. GEORGE RODRIGUE: These are just things I had fun with in the last years. BRYANT GUMBEL: Your childhood memories of Christmas very much relate to dogs, right? GEORGE RODRIGUE: I had two dogs when growing up. I was an only child, so I had like two brothers. Lady and Trixie. These dogs did everything with me. When I started making my own Christmas ornaments and everything -- I painted everything myself, I painted the manger scene -- the dogs were right there with me. And actually the dogs would sleep in the manager at night. 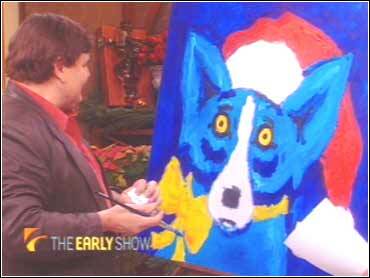 GEORGE RODRIGUE: Blue Dog was based on a dog who came about 20 years later. But looking back on things, all he dogs are interrelated to each other, and they are all based on remembrances of me and my animals. BRYANT GUMBEL: Why is Blue Dog a she? GEORGE RODRIGUE: It's a she sometimes, a he sometimes. She's a spirit, really. BRYANT GUMBEL: What are you telling us? GEORGE RODRIGUE: It's a spirit. BRYANT GUMBEL: Blue Dog is a spirit? GEORGE RODRIGUE: It's a spirit. It's a deceased dog I had in the '80s. I decided to recreate her as a Blue Dog. She's deceased, she's got the blues. BRYANT GUMBEL: You keep saying she. GEORGE RODRIGUE: She, he. He's my best friend. BRYANT GUMBEL: He never moves? GEORGE RODRIGUE: He never moves. Stays always the same. I move the insides of the dogs. Everything and inside is very loose and very graphic and fun.